It’s not an obvious thing to all: what exactly is an email list, in this context? You may have a “list” or “distribution” in your email program so you can easily send a message to a group, such as co-workers, family members, friends, or even a group that you like to pass along jokes to. If you’re smart, when you send to a group that isn’t intimately connected, you use the “BCC” (“blind courtesy copy”) so that you don’t reveal everyone’s name and address to everyone else. That’s not really what we’re talking about here, but at least most can relate to what that is. 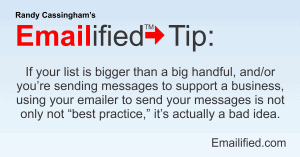 If your list is bigger than a big handful, and/or you’re sending messages to support a business, using your emailer to send your messages is not only not “best practice,” it’s actually a bad idea. (I’ll go into why later.) For large lists — where “large” is 50 or more, and even less than that when you’re sending messages regularly — it’s best to use server-based software to take care of the mailing. And that’s true even if you have your own web site, and even if you have your own server. Such email list services are called Email Service Providers, or ESPs. So fundamentally, an “email list” in this context is a physical list of email addresses you want to send to. An ESP holds that list for you and performs the task of sending a message to people on the list and, importantly, allows members of the list (“subscribers”) to add themselves to the list (“subscribe”) and — critically — remove themselves from the list should they not want to receive your messages anymore (“unsubscribe”). And that’s another reason, by the way, why it’s worth it to pay for a service: you don’t want to manually have to deal with subscription requests and, especially, unsubscription requests. You have better things to do with your time than fuss around with menial tasks that computers can do for you. And thus, more specifically, in the context of what I’ll be talking about here on Emailified, an “email list” is what’s maintained by an ESP for you, so that you can concentrate on doing business, rather than deal with the mechanics of getting your message out. One Response to First Things First: What IS an Email List? I’m really glad you’ve started this new adventure. I’ve been floundering around with the idea of how to take advantage of the 100’s of emails I’ve acquired over the years in the various businesses I’ve joined. I really need direction on how to do this and it looks like you’re exactly what I need. Thanks for doing this.